There’s nothing worse than an industry fluff piece, no matter what the industry is. A recent report circulating through the mainstream media states Vancouver Home Sales Over $1M are rising, setting the stage for a re-vamped luxury market. However, that is simply not the case. Let’s debunk this one. Here’s what the article states. “Luxury real estate expert Sotheby’s International sees good things ahead for high-end property sales in Vancouver. Official numbers from the Vancouver Real Estate Board state luxury homes sales have actually declined year to date. From January to August, home sales above $1M have declined by 18% this year. 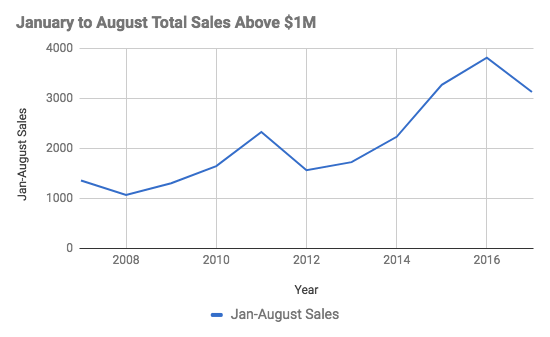 While sales have increased on a year over year basis in the last couple months (July & August) the numbers don’t paint the true picture. Comparing August 2016 sales, the very month a historical foreign buyers tax was introduced, will of course make August 2017 look like the real estate gold rush has returned. 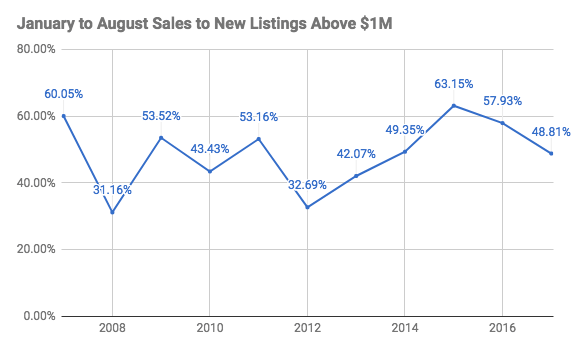 Another good metric to follow is sales to new listings. It’s one thing if sales are falling, but if new listings are also doing the same then it pretty much cancels out. However, if we look at the sales to new listings ratio for Vancouver homes above $1 Million, that too is falling. Year to date, from January to August, the ratio declined from 58% in 2016 to 49% in 2017. For simplicity sakes, there are two trends which have clearly emerged. Detached home sales, and demand is trending down (Dollar Volume down 36%). 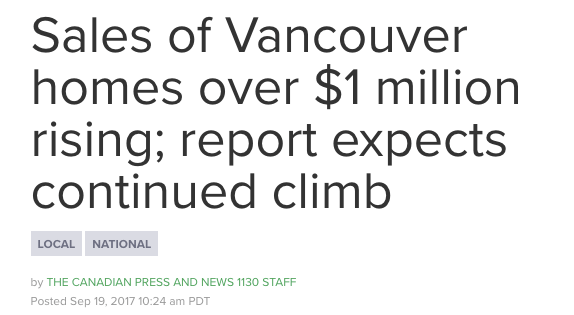 On the other hand, Vancouver condo demand and prices are trending up. Yet despite condo prices surging, adding to the overall sales above $1M, the overall year to date sales total is still below 2016. This hardly feels like a luxury market that is heating up.